I mentioned the other day that J was gathering up Halloween decorations, and that’s partly because she was excited to start our Thankful Tree. We got the idea from Family Fun, and it’s a simple, cheap craft that’s become an annual tradition. Basically, you take a tree branch (ours has been re-used a couple of times & it’s gotten a little too small, so we need to scavenge for a new one–this one’s a little dwarfed by its leaves) and stick it in a pot full of stones or dried rice or beans (I covered the rice with leftover moss from our fairy gardens). 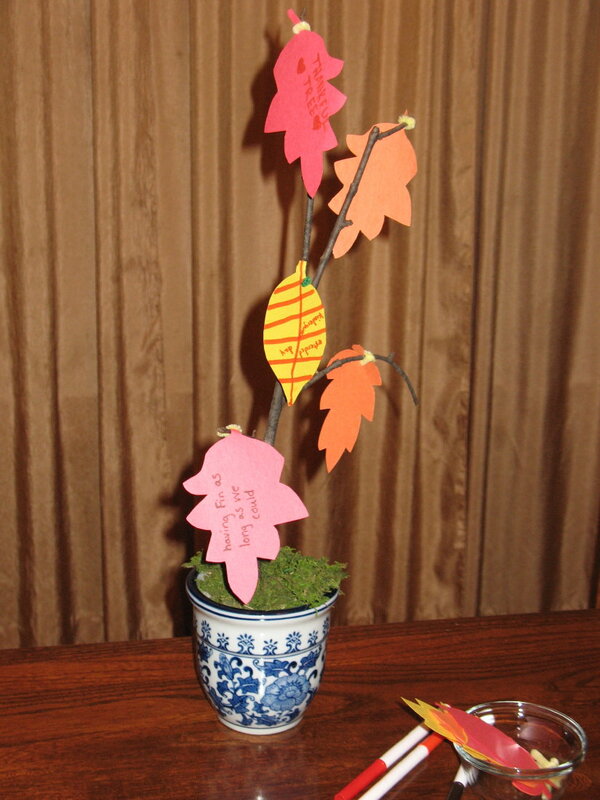 Then the kids–or grown-ups, too–write something that they are thankful for on a construction-paper leaf and hang it on the tree. I just leave extra blank leaves nearby so that the girls can add items as they become inspired. At the end of the Thanksgiving season, I put all of the leaves into an envelope labeled with the year, so it’s a nice little time capsule, showing how the girls’ writing evolves and what was important to them at that point in time. This year, M made a big fuss about her first leaf and then labeled it “TV”, and I swear that she did it just to irritate me. Honestly, I fear adolescence with that child. Occasionally I try to be optimistic and hope that she’ll be tired of scorn and rebellion by the time she’s a teen, but I know that I’m kidding myself. Take one guess about J’s first leaf. No, really: I’m serious. If you read regularly, take a guess. Now, first I have to explain that J started to write for herself, but she became frustrated and asked me to take dictation. I wrote her exact words. I mentioned this to J’s kindergarten teacher, and the teacher knew the fish by name. Great idea, we’re going to start a thankful tree today – I love it. 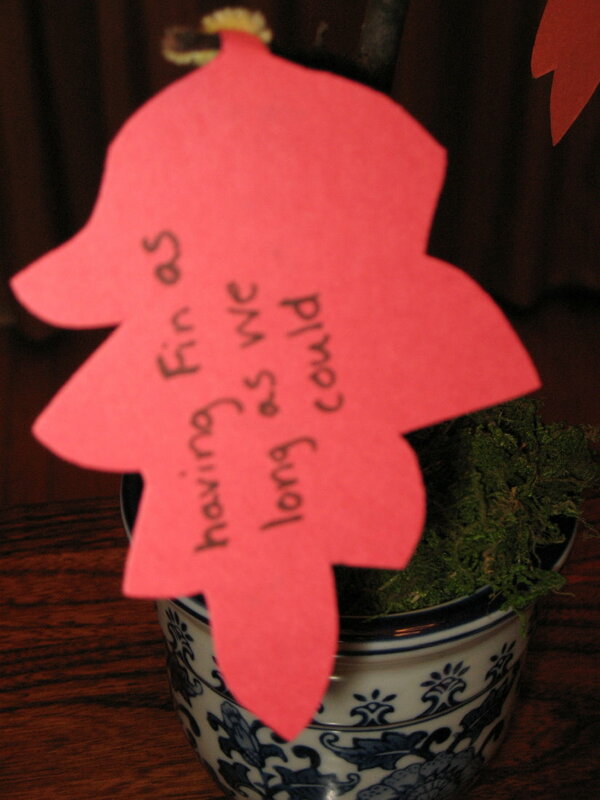 i just knew j’s leaf had to do with fin the fish!!! what a great idea! be well!